It's been a rather wacky few weeks, weather-wise. Hard to believe we are 12 days shy of first day of summer. May was nice, but then Memorial Day weekend was quite wild. I was teaching at Snow Farm during Memorial Day weekend, and man, it was bloody COLD on Sat May 25. 41 degrees during day, 30's at night, and had to break out the emergency gloves I keep in my car year-round. By Monday the 27, sun was out, low 60's and a lovely day. Had a nice group of students, 5 in all, so it was a smaller class for once instead of the 9 I've been getting for the last few years. Then by May 30, the East Coast had a monster heat wave - mid 90's. June came in with a blast. I basically hunkered down in my cool studio when I wasn't out teaching. I never know what's gonna be, day to day, but definitely an New England obsession with weather. I'm just your typical New Englander - as we say, we have two seasons - construction and winter. Construction is now in full force on every darn road and highway. I've had a chance to TA ( teaching assistant) a lot this year so far. I just TA for a mold-making and casting resin workshop today. I've always been curious about mold-making, but put off on it for it seems so complicated. In making rubber molds for lost wax casting, it is a big job, requiring a lot of materials, some knife skills and a vulcanizer. I've always sent out my metal models to be casted and have the casting company make the rubber molds for me. I know my limits and casting isn't my forte. I rather pay a casting company to do the rubber molds and cast for me. However, there's a whole world of mold-making rubber that I discovered. There is rubber that comes in two parts - mix and pour and let cure. Some rubbers require pressurization and some requires a vaccum to pull out the air bubbles. 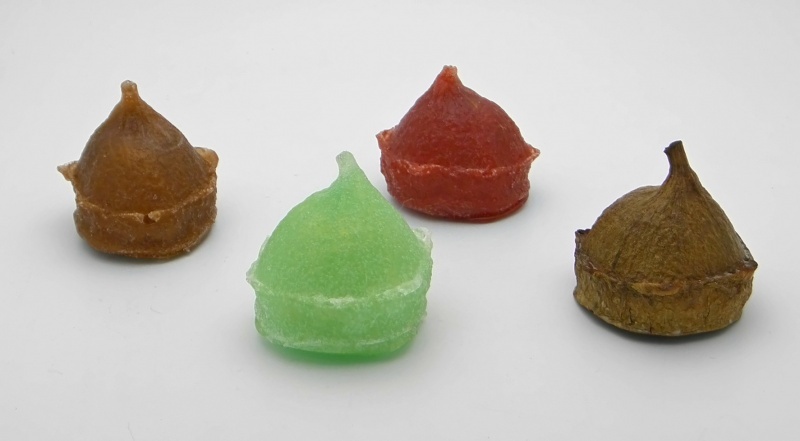 The rubber we all used in class can be mixed and poured into a simple mold using plastic cups to contain the rubber. You can pressurize it or leave it alone. I just mixed mine and let it cured. I used this thing ( brown object on right side in picture), it seems to an extra-large acorn cap ( probably some gaint seed) that has been bumming around my desk for the past year or 2, sealed it with wax and them made a rubber mold of it. I didn't pressurize the rubber for there was too many students using the pressurizer and I just wanted to just try it out. Anyways, the mold was successful and after mixing this really nice liquidly resin with some Pearl EX mica pigments, I got 3 castings. The green one was the first, the red was the second and the brown on the left is the last casting. One of the teachers remarked it should be a helmet for a chipmunk.. Now, if I can get one of my many chipmunks that live on my land to stand still long enough, I can certainly try making a chipmunk helmet. Bottom line: it was a lot easier to mold something and cast it in resin, than I thought. It wasn't something I would have taken willingly, but since a TA was needed at the last moment, and I was available, I figured, why not? I'm glad I did it for I learned it was quite approachable to do your own molding and resin casting. I'll be TA'ing for a chain maille workshop on Friday the 14th, and that should be fun for I've never really did chain maille. Opening and closing hundreds or thousands of jump rings isn't my cup of tea - knitting wire is my cuppa of tea. I'll post an update on how it goes and what I end up making.